Starting your digital marketing can be an exciting and nerve-wracking experience. The bar for entry has never been lower but can quickly overwhelm businesses as they try to keep up. It’s easy to invest too much time and energy or lose sight of objectives as you chase the next big thing. In this blog, we’re looking at how it’s essential to set marketing goals and – just as important – make sure you make your marketing and business roles around those goals, rather than chasing new ideas that get you off task. Of course, the first step here is to identify your marketing goals: what is your metric for success? Are you looking to appear higher on your search rank? Are you looking to boost your online presence on social media? Are you looking to bring in X more number of leads each month? Set a goal or goals to get started. Take Caution Tying Goals to Money: It can be tempting to bottom-line your goal as an income or gross profit. The issue with this is factors outside marketing – if you’ve had costs due to damaged property or loss of goods, marketing is blameless in the math. Set Reasonable Goals: What kind of money and time can you put into marketing? This needs to be factored in when planning your goals. Set goals with reasonable timeline and metrics unless you’re willing to spend an unreasonable amount of resources pursuing them. Setting goals are often part of a larger plan, especially when working with a marketing agency. Learn more about marketing plans and their importance in goals and execution in our blog, Making Marketing Plans: Measure Twice, Cut Once. When we’re called in to assist new clients, we start by analyzing their past marketing and goals. Often what is found is the wreckage of several goals and plans as clients pursued a goal before getting distracted by an “easier” or newer option that promised quick results. From new platforms to new apps, these shifts in marketing waste all the previous time and effort spent, and leave half-finished or dead social media presences, websites, and listing – all of which can damage a company’s online presence, reputation, and consistency. Now, with that said your marketing plan has to be flexible and adapt to reach your goals on digital marketing. If your goal is hitting a thousand followers on Facebook which you’re achieving by running ads, Facebook changing how ads work again could throw your plan. But that doesn’t mean you should abandon your goal. 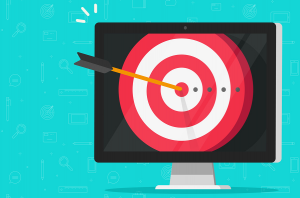 Switching your ad targeting, increasing organic posts, running contests, or producing Facebook-specific content are all ways to reach your goal. When your situation changes or you’re looking to miss your goal, adaption – not abandonment is key. Lastly, it’s essential to be able to track your goals. Make sure you’ve got the right tool installed and monitored to make sure you can tell when you’re reaching your goals. Track how quickly you’re getting there, where the success is coming from, and always be on the lookout for problems. Install Google Analytics: Google Analytics is a tracking and reporting tool that can be installed on websites, allowing you to track traffic, where it comes from, and what it’s doing on your site. Track Social Media: Monitor your social media for trends. What posts had huge engagement and brought in new fans? How are ad impacting your organic traffic? What platforms work best for your business? Analyze Your Data: It’s important to be able to read the data you get from all sources, from page ranking to user engagement. Take time and do reporting for yourself and your company to track progress regularly. Setting New Goals: If you’re getting close to your goal – or if after long consideration you’re looking to change your goal, it’s time to look at new goals. What was the success of your last goal and how did it impact your bottom line? That’s a great place to start planning the next. Here at Vision Advertising, our mission is to help our clients plan out their goals and help them reach them. It’s a partnership that turns marketing from a guessing game into a strategy. If you’re looking to learn how an agency can help you, we implore you to contact us. Want to read up a little more? We suggest Identifying Your Ideal Client Profiles and Marketing Consultation: The Importance of a Comprehensive Agency as related reading.